This blog has moved on. 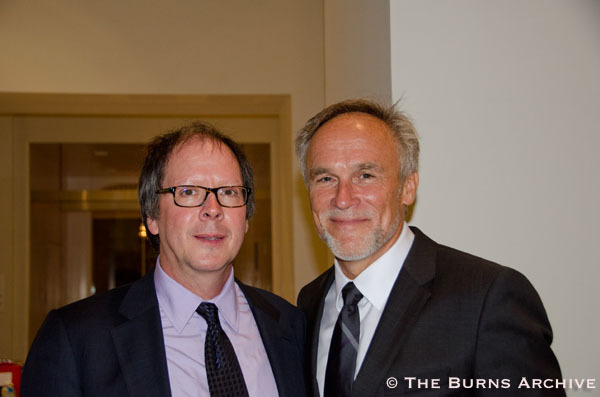 Visit burnsarchive.com or see #burnsarchive on twitter, tumblr, facebook. and a discussion of Stiffs, Skulls & Skeletons: Medical Photography and Symbolism by Dr. Stanley Burns of The Burns Archive. 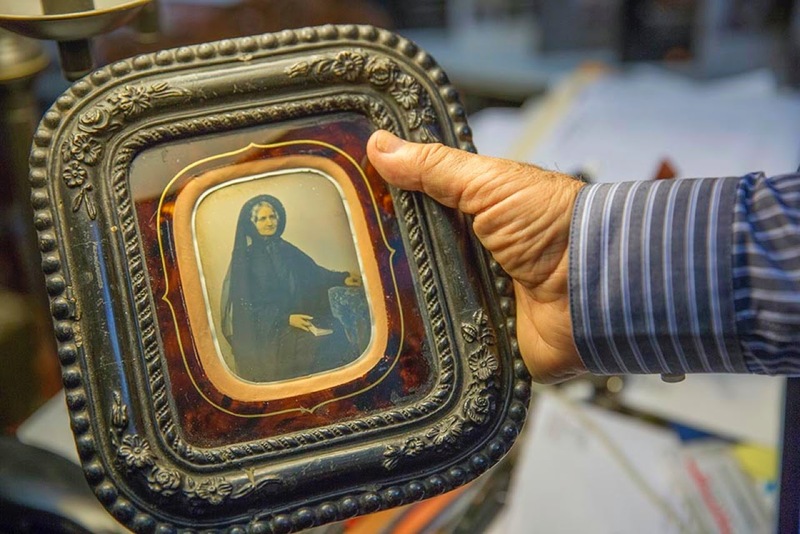 Hosted by Paul Moakley, the museum's caretaker and curator, who will recount Alice Austen House ghost stories dating back to the Revolutionary War. Shows begin at 6:00pm and 8pm sharp. 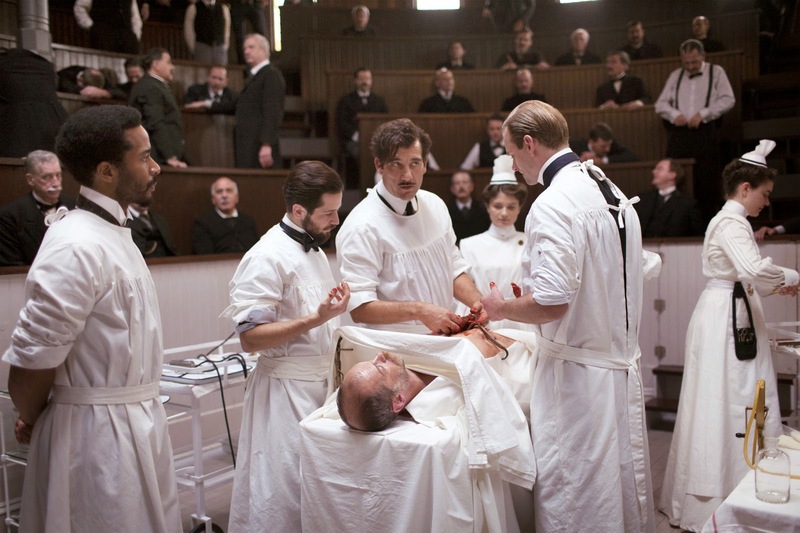 "The Knick Season 1: Surgery 101"
The actors from THE KNICK discuss training for surgery with Dr. Burns. 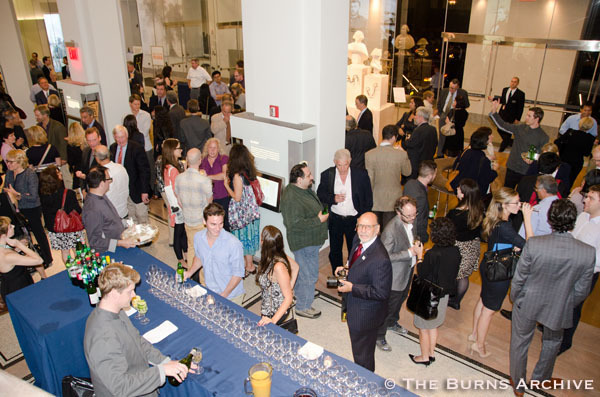 On Friday, September 12th until October 10th, RESOBOX will be hosting its third annual Burns Archive photography exhibit. This year, the exhibit will feature a collection of nineteenth-century, hand-colored images of Japan, especially focused on "island lifestyle". 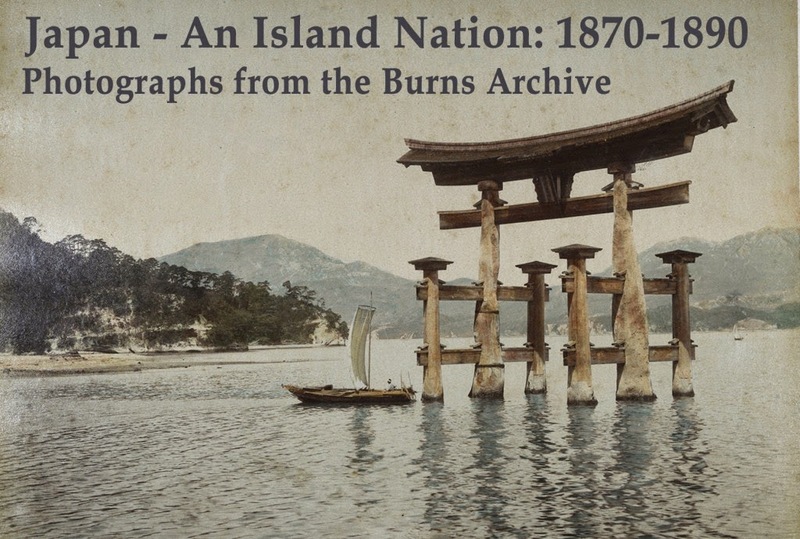 In the exhibit “Japan: An Island Nation”, Elizabeth and Dr. Burns continue their exploration of photography in Meiji Japan. The photographs taken by noted commercial photographers document the landscape, ports and people working on the water. The images offer a glimpse into the visual landscape of Meiji Japan, where water played such an important role. 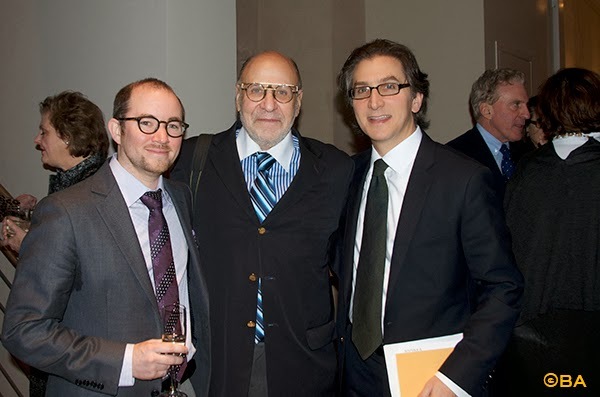 Listen to Dr. Burns talking about the creation of the Knick with writers Jack Amiel and Michael Begler on NPR's Fresh Air. 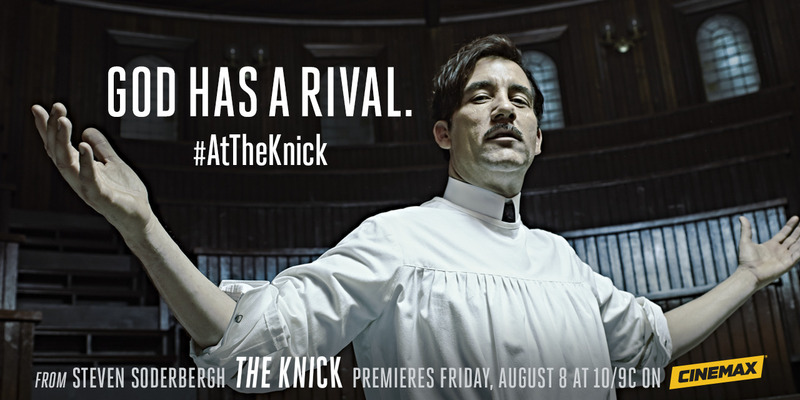 Watch THE KNICK tonight on Cinemax! 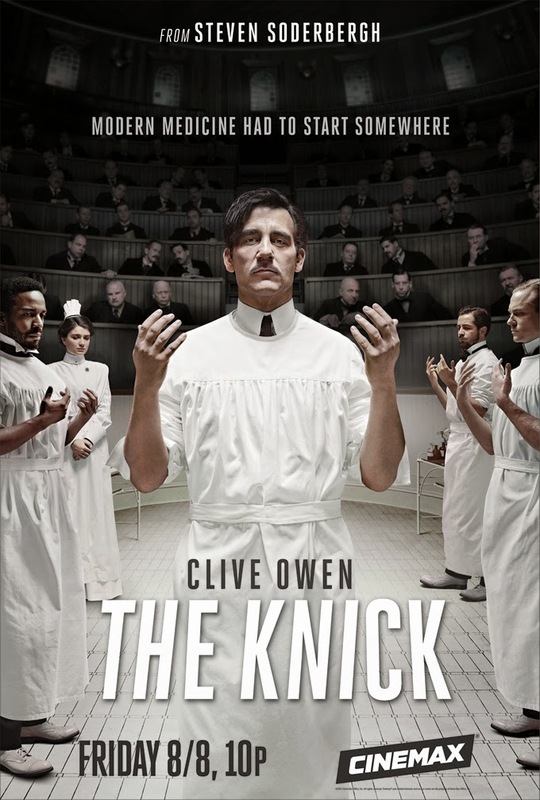 See what Steven Soderbergh has to say about Dr. Burns and The Knick in BLOODY HELL: STEVEN SODERBERGH DISSECTS HIS MODERN, 1900S MEDICAL DRAMA, "THE KNICK"
“I wanted those scenes to be accurate and be graphic enough to be a topic of conversation,” says Soderbergh. 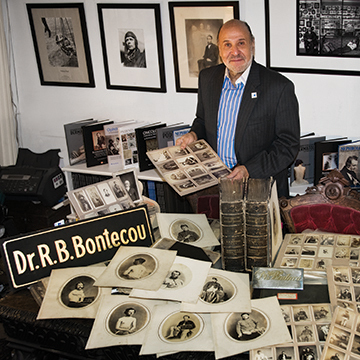 “I don’t feel like they’re gratuitous, but they are extremely graphic.” The production team worked with consultant Dr. Stanley Burns of the Burns archive, keeper of the world’s richest textual and photographic record of medical history. “The amount of material we had access to was unbelievable. 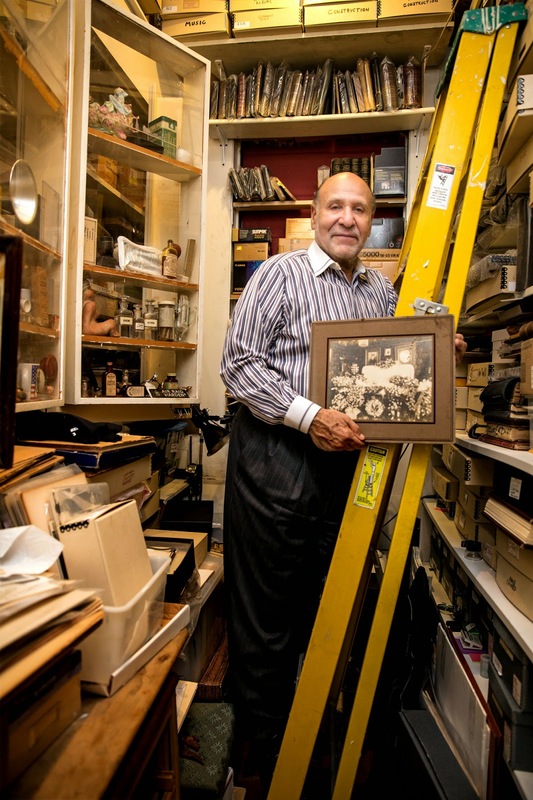 His five-story brownstone/museum is incredibly comprehensive. We had a bucket of procedures that would suit any story point we needed to make. If we said we need a procedure we can tease out of for this many episodes, or just a one off, we’d call him up and say, 'What do you have?'" The New York Times Arts & Leisure Section on Sunday, August 3rd, 2014! "Often his mantra was 'more clamps and more blood.' "
Mr. Owen says the surgery scenes were particularly taxing. In the operating theater, he had to speak with nurses and fellow doctors, explain the surgery to spectators—and at the same time make sure his surgical handiwork looked convincing. "I'm playing this genius doctor, so you don't want the [camera] cutaway to somebody else's hands being brilliant," Mr. Owen says. 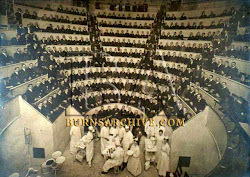 A historical consultant, Dr. Stanley Burns, supplied period photographs of operations and advised on the surgery scenes. Mr. Owen says, "Often his mantra was 'more clamps and more blood.' "
The Knick: Season I premiering soon! 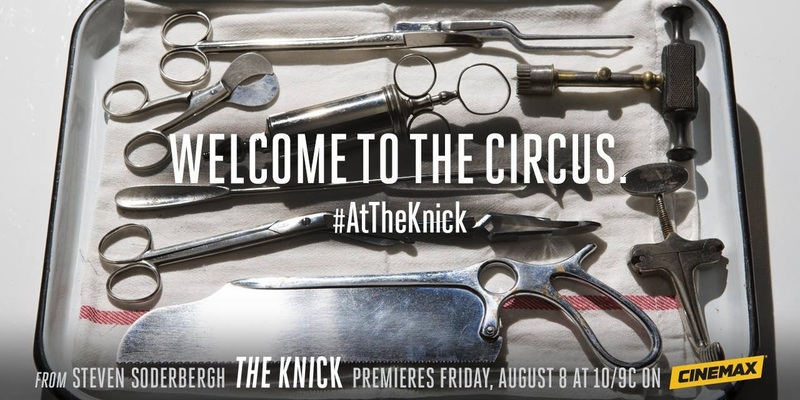 The Burns Archive is proud to have worked on the upcoming series "The Knick"! New York City, 1900: The Knickerbocker Hospital is home to groundbreaking surgeons, nurses and staff who push the boundaries of medicine in a time of astonishingly high mortality rates and zero antibiotics. The newly appointed leader of the surgery staff is the brilliant, arrogant renegade Dr. John Thackery, whose addiction to cocaine and opium is trumped only by his ambition for medical discovery and renown among his peers. Into the all-white staff and patient hospital comes the equally gifted Harvard graduate Dr. Algernon Edwards, who must fight for respect while trying to navigate the racially charged city. Trying to maintain its reputation for quality care while realizing a profit, the Knickerbocker makes an effort to attract wealthy clientele, while literally struggling to keep the lights on. 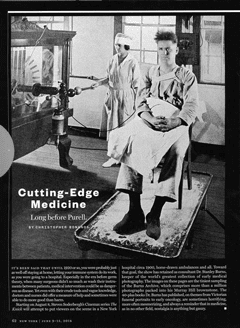 Stanley B. Burns, MD and The Burns Archive served as the historical, medical, and technical advisers on the series, working closely with production and the actors to make the operative and hospital scenes realistic and authentic to the times. 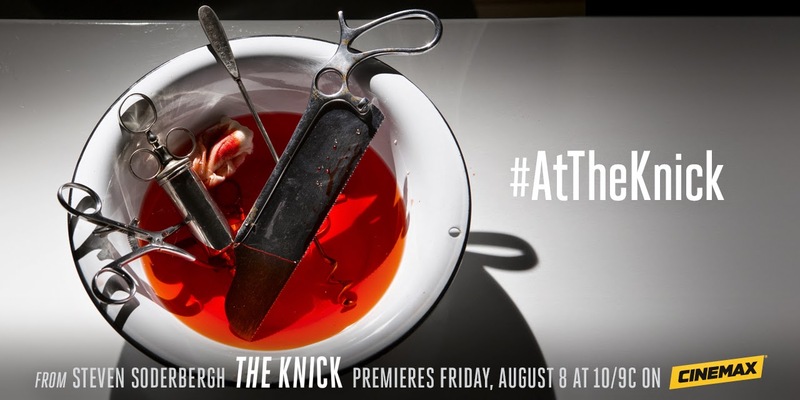 Starring Clive Owen and directed by Steven Soderbergh, THE KNICK kicks off its ten-episode season FRIDAY, AUG. 8 (10:00-11:00 p.m. ET/PT) on CINEMAX, followed by other episodes debuting subsequent Fridays at the same time. The Morbid Anatomy Museum Grand Opening Party was a splendid affair. Dr. Burns gave an informative tour of the collection, and a magnificent time was had by all. Stanley B. Burns, MD, Man of Forgotten Science, is profiled in The Weekend Arts Section of Today's New York Times in the article "The Dark Side Gets Its Due: The Morbid Anatomy Museum Opens in Brooklyn." 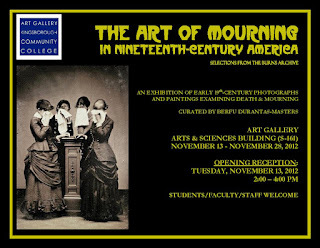 The Morbid Anatomy Museum opens at its new location with the exhibit "Art of Mourning," which will showcase decorative arts relating to mourning culture from the 18th to the 20th century featuring never before exhibited artifacts (including a wide variety of mourning ephemera, cased photographs, celluloid buttons, etc.) largely drawn from the private collection of Stanley B. Burns, MD and The Burns Archive. Photograph © Stanley B. Burns MD, & The Burns Archive. showcased medical images from The Burns Archive! Welcome to The Burns Archive Blog! and enjoy images and anecdotes of recent occurrences, along with photographs of the long-distant past from our collection. You are invited to follow us. Our new journey has just begun! Dr. Burns attended this fascinating book signing of The Morbid Anatomy Anthology edited by Joanna Ebenstein and Colin Dickey at the future home of the Morbid Anatomy Museum. 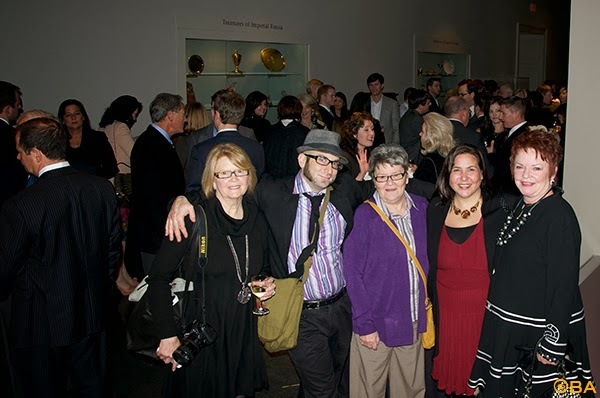 Caught on camera… Joanna Ebenstein, Alice Dana, Colin Dickey, Evan Michaelson, Amber Jolliffe and a host of others! Best of all was the cake (based on the moulage of Venus). 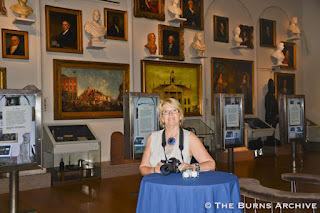 Check out the museum, it's a fantastic place! 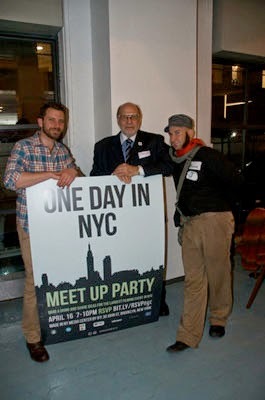 On April 16th, Dr. Burns attended a party for One Day in New York, which is part of a collaborative effort to document eleven American cities on one day. It takes place on April 26th, 2014. The One Day on Earth project documented the planet on 10/10/10, 11/11/11, and 12/12/12. Executive Producer Brandon Litman and his team continue to coordinate the documentation of the human condition. 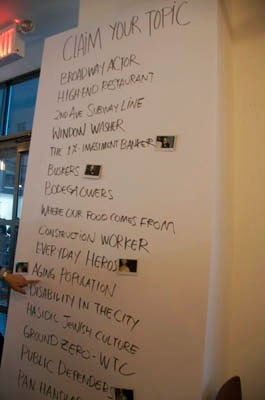 The current project from the organization focuses on cities rather than the wider world. Eleven American cities are taking part on 4/26/2014 in this collaborative "One Day on Earth" project. To find out more or get involved where you live, take a moment to check out Your Day Your City. 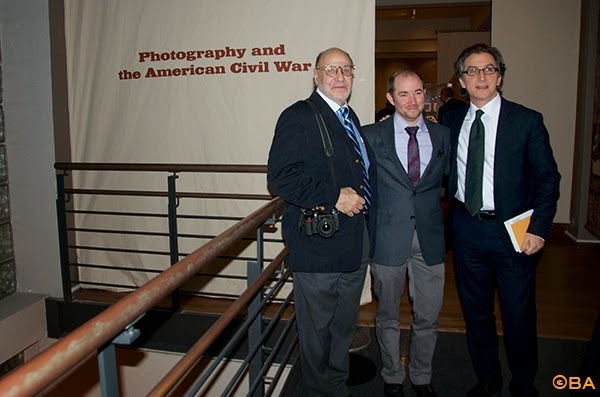 “Photography and the American Civil War” in New Orleans! 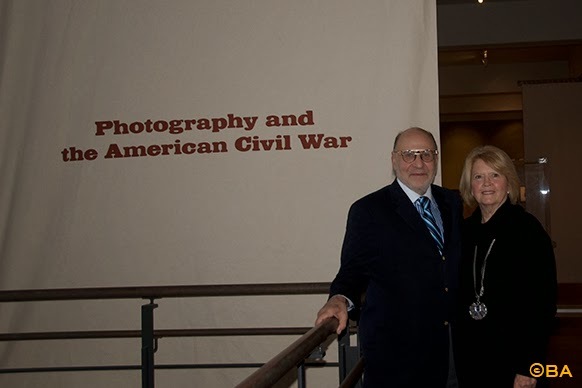 The extraordinary exhibition, “Photography and the American Civil War” opened at the New Orleans Museum of Art on January 30th. 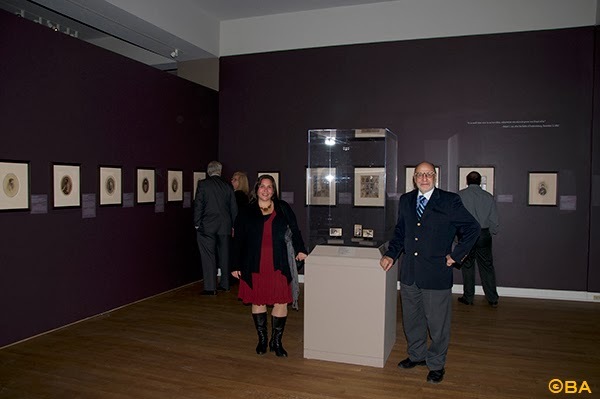 Dr. Burns and staff travelled to the opening, despite a snowstorm that cancelled flights and closed roads. 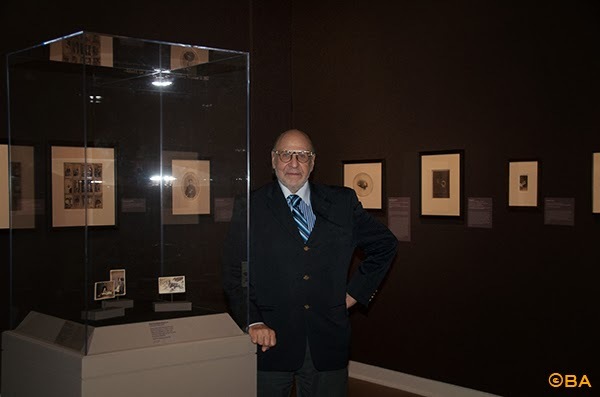 Also able to escape a frigid New York for a freezing New Orleans was Jeff Rosenheim, Chief Curator of Photography at the Metropolitan Museum of Art and curator of the exhibition. 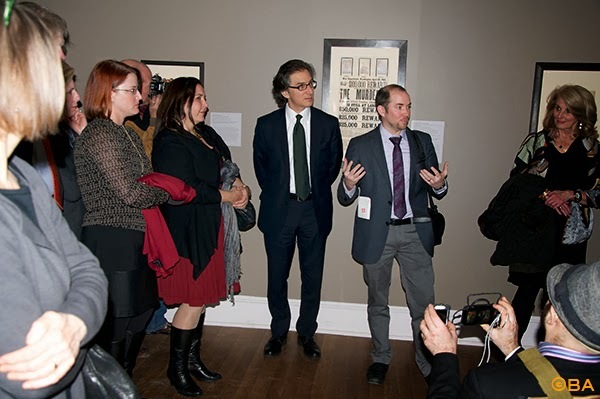 Russell Lord, Curator of Photographs at NOMA graciously hosted two receptions, and, with Jeff, led a tour through the galleries. 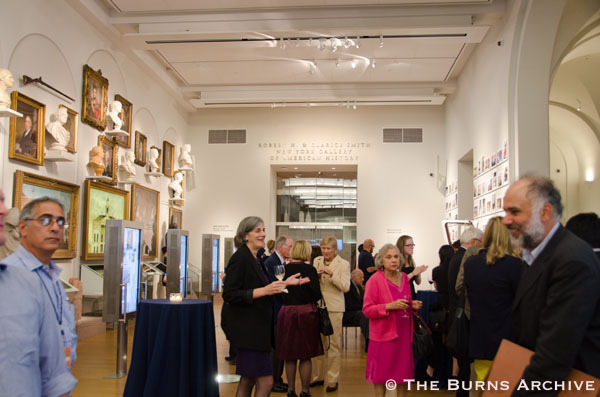 The exhibition showcases photographs of wounded Civil War soldiers from The Burns Collection, as well as hundreds of amazing images from the era. It was also a pleasure to see Sarah Simms former employee of The Burns Archive! 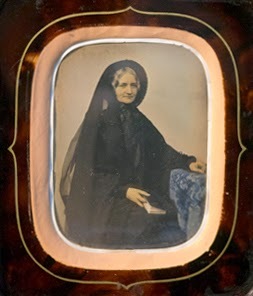 She worked with Dr. Burns on the book, Shooting Soldiers, Civil War Medical Photography by R.B. Bontecou. If you missed it in New York and Charleston, see it in New Orleans until May 4, 2014! 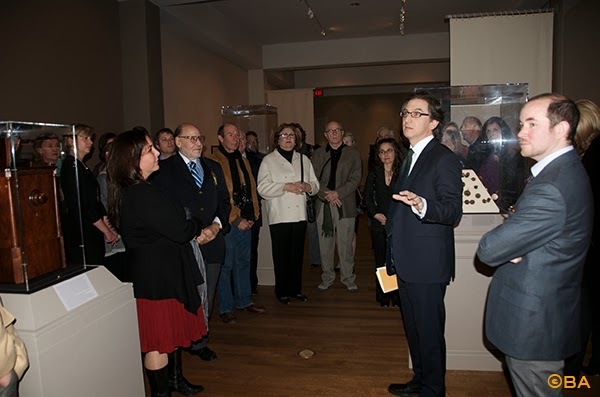 Opening Reception for "Working Life in Meji Japan 1868-1912"
You could have joined us! 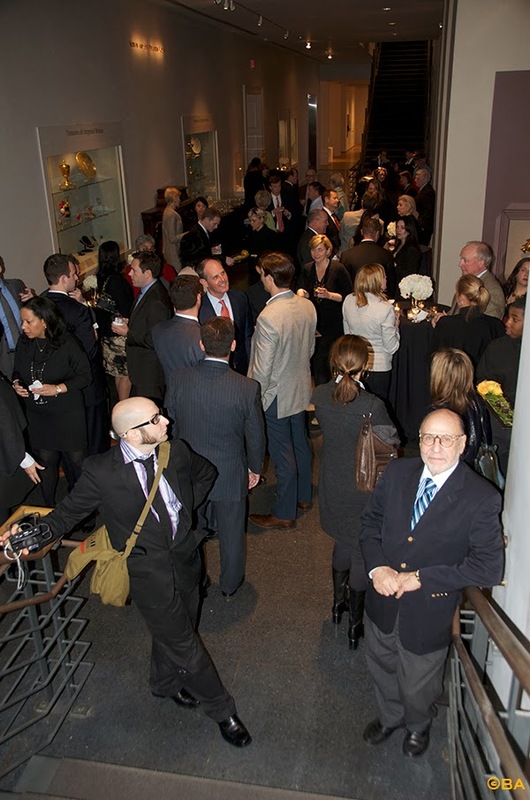 The reception was Friday, November 15, 2013 from 7pm-9m at the Resobox Gallery. This exhibition features nineteenth century hand-colored photographs of Japanese entrepreneurial class culture from The Burns Archive. The images showcase the best of Japanese photographs that were created to show the perceived exotic nature of Japan to the West. We hope that you will join us for a glass of saki or a cup of tea! The exhibition ran from November 8-December 5, 2013. However, you can check out pictures from the exhibition and reception at Resobox. The Resobox Gallery is easily accessible from Manhattan. Take the 7 or N train or E or F to Queensboro Plaza. The gallery is on 27th Street, less than a half a block from the elevated line station. 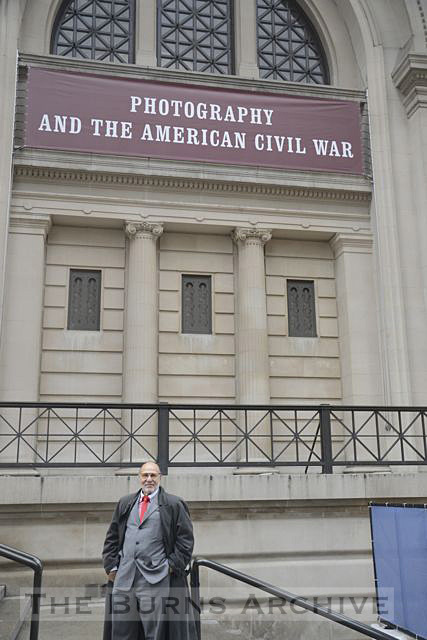 Last chance to see "Photography and the American Civil War" at the MET! 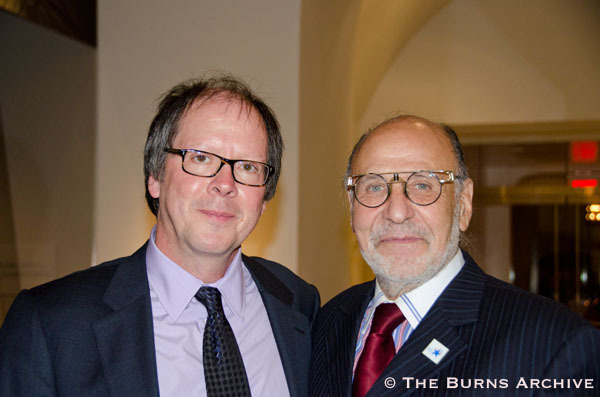 Throughout the summer, a number of publications as well as news outlets have covered the immensity of this exhibit, and the amazing job Chief Photography Curator, Jeff Rosenheim, has done. As part of their ongoing Study Day series, Stanley B. Burns M.D. 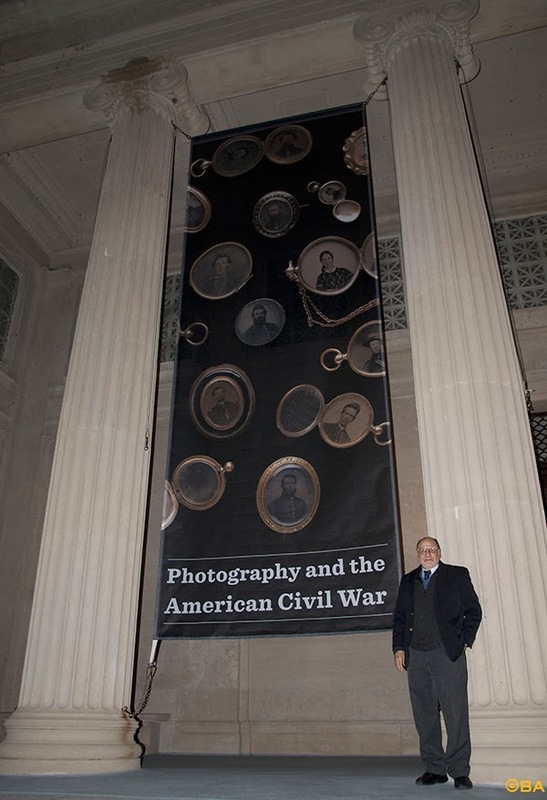 was part of a distinguished panel of lecturers for a day-long event, “Study Day: The American Civil War and the Body.” A personal tour led by Jeff provided ticket holders with fascinating details about the photographs in the exhibit. 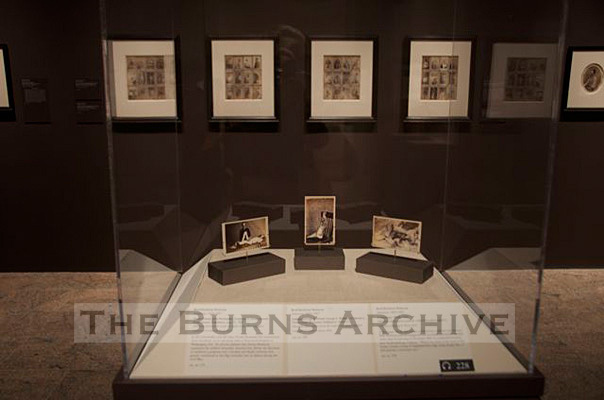 Visit the exhibit before it’s gone and see an entire space dedicated to images from The Burns Archive. The exhibit ends September 2, 2013. 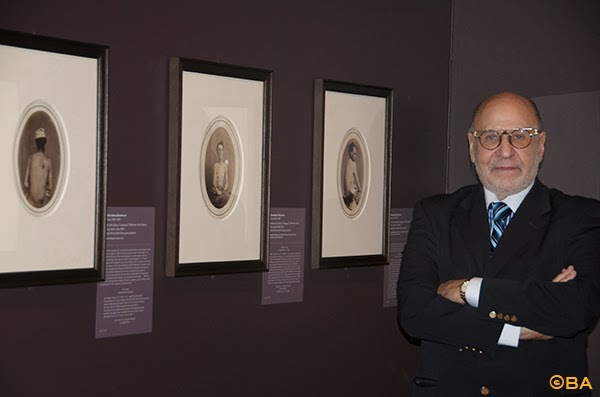 Jeff Rosenheim, the Metropolitan Museum of Art's curator of "Photography and the Civil War," discusses images and details that provide a more intimate look at those who shaped our nation’s history and the photographers that travelled among them, documenting every step of the way. Although the segment aired Sunday, it is viewable online (notice our Bontecou photographs in the opening of the interview!). For those who can’t make it to the Metropolitan Museum of Art before September 2nd, the exhibit will be headed to Charleston and New Orleans in the coming months. Friday, May 31, 2013 10:30 A.M. – 4:30 P.M.
Dr. Burns is part of a panel of distinguished guests speaking at an all-day seminar that engages in critical discourse about works of art in the galleries, as well as discussions and short lectures about the trauma of war through differing perspectives, ranging from historical to medical. Dr. Burns lectured in front of a full-house Tuesday evening on PostMortem Photography and Memorialization in 19th Century America at the Museum of the City of New York. 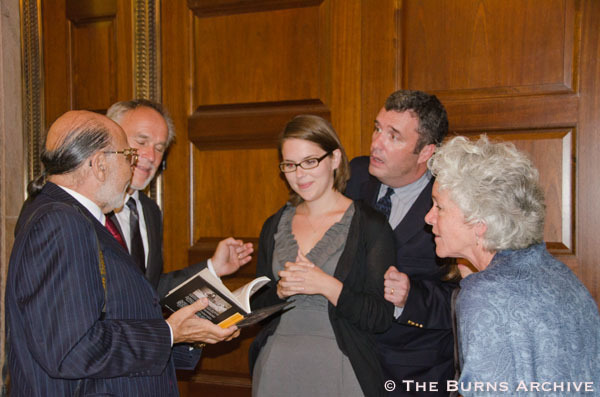 The hour-long presentation was recorded by C-Span for American History TV (stay tuned for more information!). 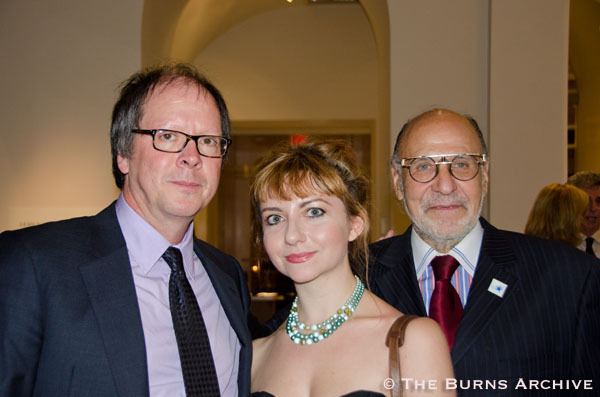 The event followed a week after the opening reception commemorating Green-Wood Cemetery’s 175th Anniversary, a New York iconic institution. But enough about accolades, let’s look at some snapshots. Photography of the dead was a common practice in the 19th and early 20th centuries, a way for mourners to visually “embalm” their loved ones. Until recently, however, this once ubiquitous genre of American photographs was largely unexplored. 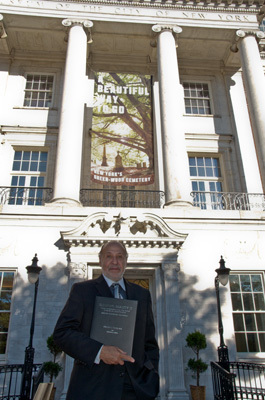 Dr. Stanley B. Burns, Professor of Medicine and Psychiatry, NYU Langone Medical Center, and distinguished author, archivist, and collector, has amassed the most comprehensive collection of this genre in the world and published three books on the subject: the Sleeping Beauty series. 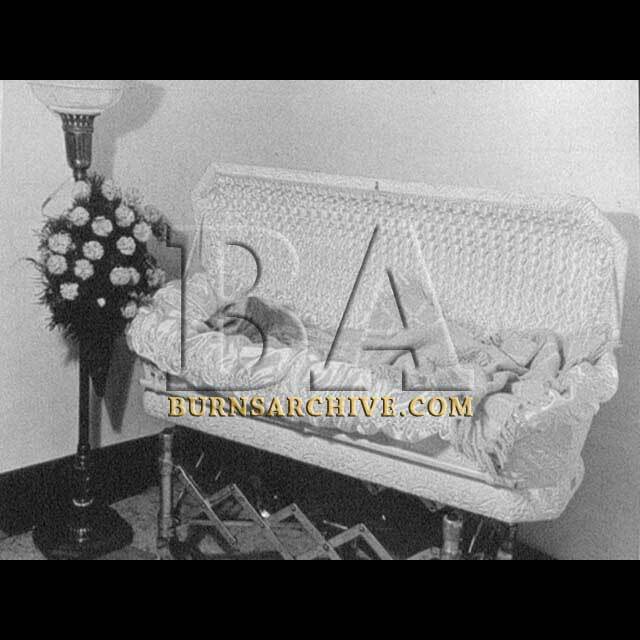 Dr. Burns will speak about how postmortem photography shaped American culture in the 19th century. Presented in conjunction with A Beautiful Way to Go: New York’s Green-Wood Cemetery and Co-sponsored by The New York Academy of Medicine. 'C-Span' the Cable Satellite Public Affairs Network will be videotaping this lecture for presentation as a program on their American History series and will be available from their video library. This would be perfect as a teaching supplement to the history of photographic processes and the changing nature of memorialization practices. The lecture is based on our Sleeping Beauty memorial photography book series, available from the Burns Press website. For more information or to register by phone, please call 917-492-3395. Information on how to RSVP can be found at the museum's website here. #6 Lexington Avenue train to 103rd Street, walk three blocks west, or #2 or #3 train to Central Park North/110th Street, walk one block east to Fifth Avenue, then south to 103rd Street. Ramp access is available at the 104th Street entrance. 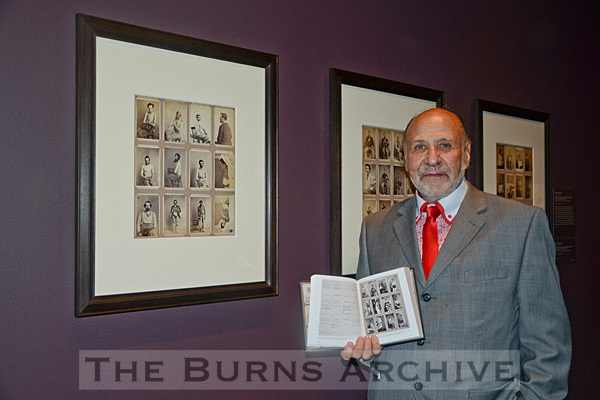 Dr. Burns’ collection of medical photographs are showcased in a dedicated room as part of the MET’s exhibit. 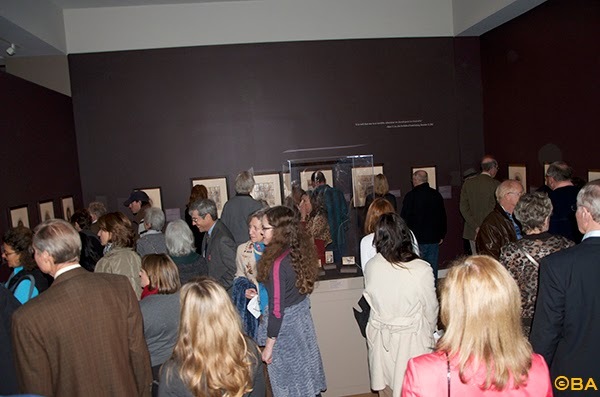 The photographs of wounded soldiers and operative scenes taken by Civil War surgeon Reed Brockway Bontecou, MD are presented for the first time in a major art museum. Taken originally to show the effects of wounds, complications and the result of treatments the images are now recognized as among the highest level of portraiture. While it’s easy to photograph a beautiful subject, Bontecou photographed suffering and disability with a universal appeal as a result of his artistic posing and interpretation of war wounds. Jeff Rosenheim, Chief Curator of Photography of the MET and curator of this exhibit, has long recognized the artistic power of these portraits. The photographs show not the bravado of men about to enter battle, an all too familiar topic of interest for collectors and curators, but the true personal results of war for service personnel and their families. These images portray men, young and old, starring at us stoically, carrying their wounds. They are presented as people, not specimens, as a result of Bontecou’s art in posing. The images are significant additions to the visual culture of war and American medicine.The photographs are eloquent works of art that offer unflinching testimony to the suffering caused by America’s bloodiest war in which over 750,000 died and hundreds of thousands were wounded. The exhibit is about documenting the war as well as the evolution of the medium of photography itself. Bontecou’s images presented near the end of the exhibit are representative of this evolution. The slideshow provides a brief glimpse of the patrons party, the exhibition room with Dr. Bontecou’s photographs and the opening night reception. Dr. Burns text- Shooting Soldiers: Civil War Medical Photographs by R. B. Bontecou is available form the Burns Press. Before he began collecting photography, Dr. Burns’ interest in WWII and the Nazi Genocide stimulated him to collect items related to the war, especially Nazi soldier album snapshots. He has since used them in creating computer-enhanced artwork based on the images. To facilitate comprehension and remembrance of the Holocaust, images are enlarged without being altered, then colorized with the yellow of the Jewish star worn by those in ghettos. He adds poignant captions, creating an amplified ‘Word-Image’ from these snapshots and a new visual dimension to the vocabulary of the visual culture of the Holocaust. Photographs from the 24th Daguerreian Society Annual Meeting and Trade Fair, November 8-11, 2012. Baltimore, MD. 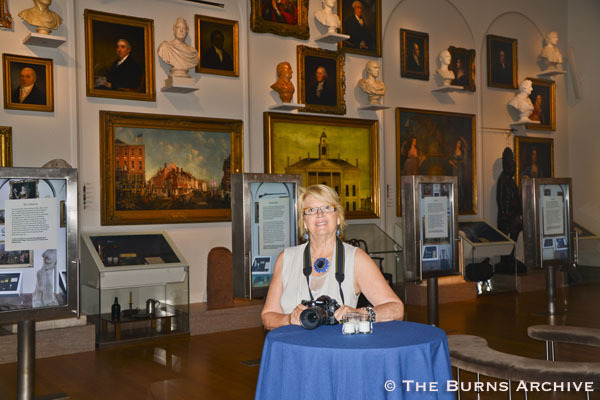 Dr. Burns attended and had a book signing for his latest publication, “Mirror Mirror: The Burns Collection Daguerreotypes.” The trade fair was attended by collectors and curators as well as several Washington D.C. and Baltimore museum staff. The highlight of the meeting was Matt Isenburg’s lecture discussing the sale, packing and shipping (about 2 months!) 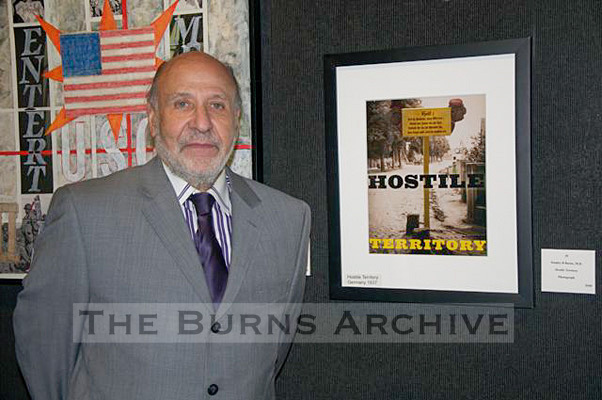 of his noted collection to Toronto’s AMC (the Archive of Modern Conflict). Dr. Burns had a great time meeting with old friends and making new ones, and cannot wait for next year’s meeting.... in Paris! 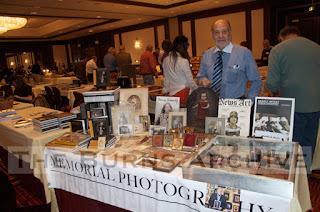 Dr. Burns at his table with written publications and photographs. 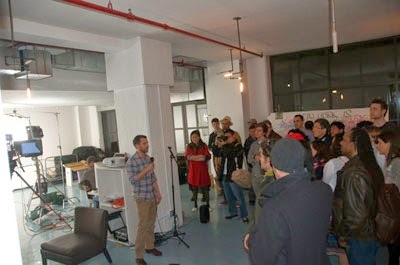 Here are some photographs from our opening reception at the Resobox Gallery in Queens, which we blogged about yesterday. Attendants included the Consulate General of Japan, Masakazu Kigure, as well as several Japanese artists and media reporters. Patrons enjoyed sake and Japanese delicacies, and a wonderful ceremonial tea ritual was performed throughout the evening by Japanese Tea Master Souheki Mori of Tea Whisk in New York. The Burns Archive would like to thank founders Fumio Tashiro and Takashi Ikezawa for exhibiting our historical photographs. We hope you stop by and enjoy the space. Join the Art Gallery at Kingsborough Community College this afternoon! 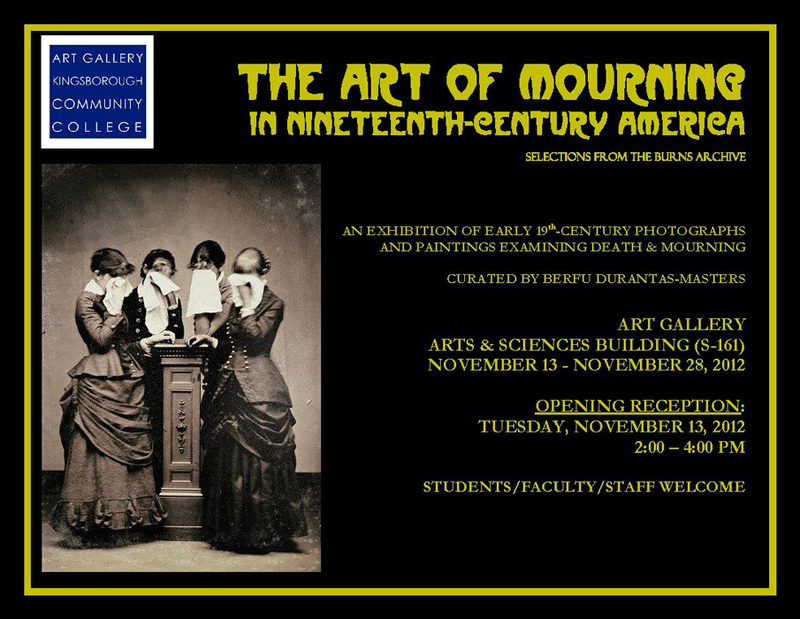 The exhibition will showcase mourning portraits, memorial artworks, and post-mortem photography (daguerreotypes, ambrotypes, tintypes, cartes-de-visite, and cabinet cards) from the archives of Dr. Stanley Burns, located in NYC, curated by Berfu Durantas-Masters, Professor of Art History, Kingsborough Community College and lecturer at the Cloisters-Metropolitan Museum of Art. There is a free catalogue to accompany the exhibit. The exhibition has been extended into December, is free and open to the public. Gallery hours are 10am-3pm, Monday-Friday. Car: Belt Parkway to Exit 8 (Coney Island Avenue) then follow signs. Bus: B-1 and B-49 bus to last stop. Train: BMT Brighton line - B or Q train to Brighton Beach Station, then take B-1 bus to last stop. A ritual tea ceremony will be performed by a Japanese Tea Master at the reception. 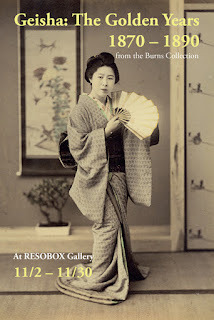 The Resobox Gallery is proud to present an exhibition of nineteenth century hand-colored photographs of Geisha and Maiko from the Burns Archive. 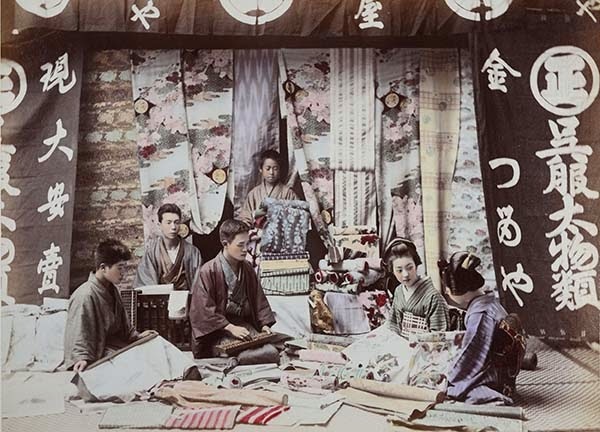 These photographs are the original images used by Dr. Stanley Burns and his daughter Elizabeth to create their noted book Geisha: A Photographic History: 1872-1912. The images in this exhibition showcase the best of Japanese photographs that were made to show the perceived exotic nature of Japan to the West. Several of the great early photographers’ studios are represented, including Kusakabi Kimbey, Ogawa Kazumasa and Baron von Stillfried. The opening was originally scheduled for November 2nd but rescheduled for tonight due to weather events (like hurricanes... P.S. We are all OK!). 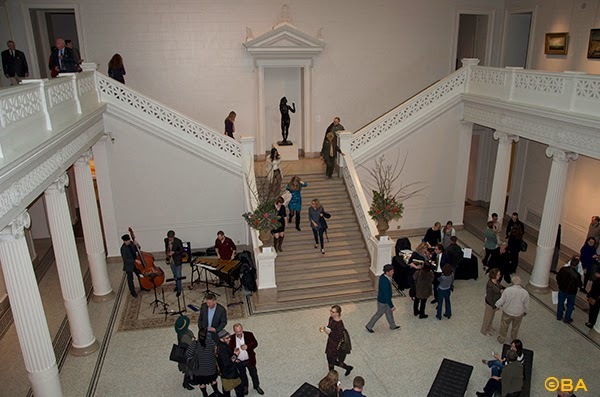 The gallery is readily accessible from Manhattan. Take the 7 or N train or E or F to Queensboro Plaza. The gallery is on 27th Street, less than a half a block from the elevated line station. 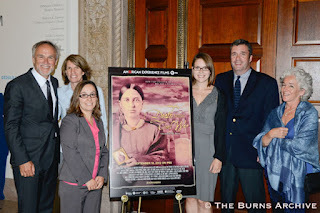 The archive staff attended the premiere at the New York Historical Society, September 13, 2012. 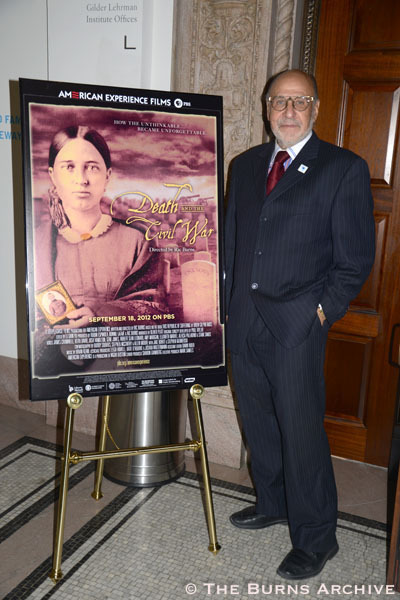 Dr. Burns has contributed medical and memorial photographs to Ric Burns’ latest documentary: Death and the Civil War, which began its run on PBS September 18th. 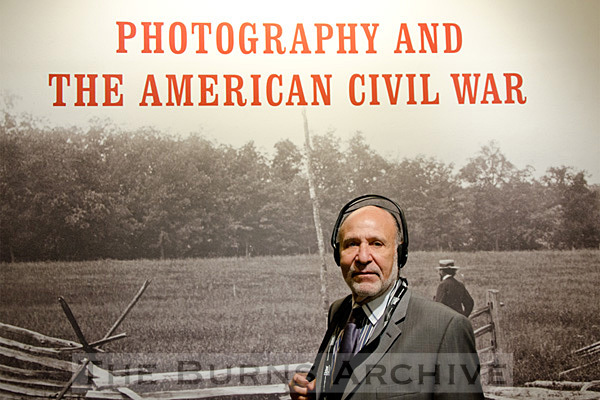 Images from Dr. Burns’ books, Sleeping Beauty: Memorial Photography in America and Shooting Soldiers: Civil War Medical Photography by Dr. Reed Bontecou, were among those used in preparing the film. 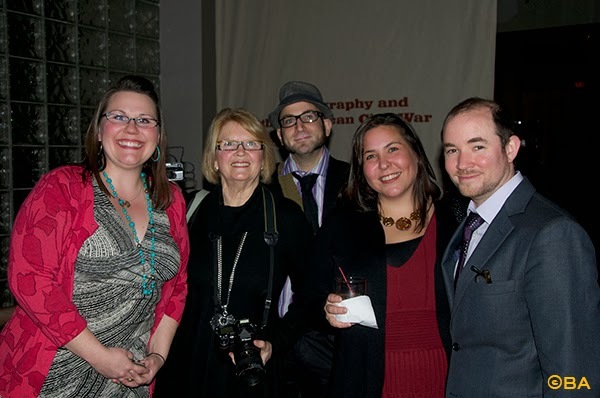 Staff from various organizations affiliated with Ric Burns’ production company, Steeplechase Films, as well as WGBH and the American Experience were also in attendance. 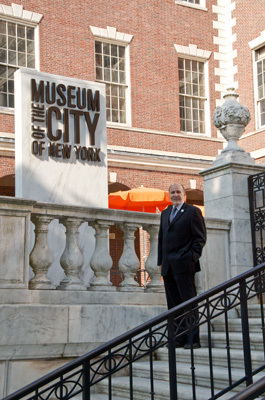 Mayor Bloomberg provided comments about Ric’s accomplishment. 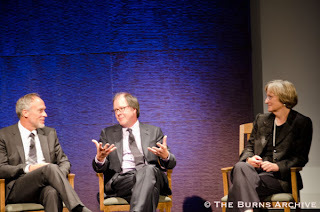 After viewing parts of the film an audience discussion was led by Ric Burns with Drew Gilpin Faust, President of Harvard University and author of The Republic of Suffering… and Mark Samuels, Executive Producer of the American Experience. 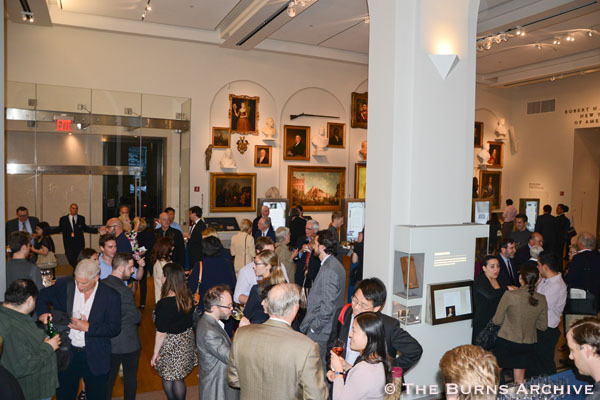 The reception was held in the artifact festooned halls of the historical society’s newly designed Robert H. and Clarice Smith New York Gallery of American history. 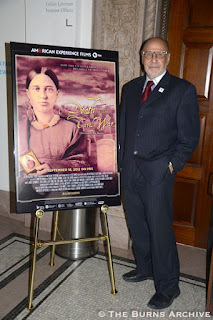 Discussions and promotional videos of the film can be can be seen at the American Experience and Ric Burns’ Steeplechase Films. 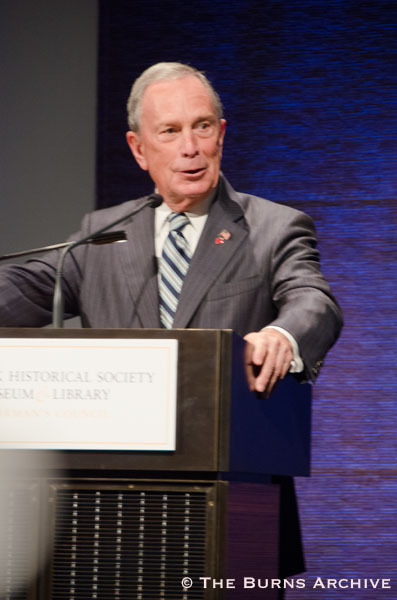 New York City mayor Michael Bloomberg commenting on Ric Burns' Death and the Civil War. Mark Samuels, Ric Burns and Drew Gilpin Faust leading an audience discussion after the premiere. Dr. Burns at the premiere for Ric Burns' Death in the Civil War. and author of The Republic of Suffering: Death and the American Civil War. Filmmaker Ric Ross and Dr. Stanley Burns at the premiere. Filmmaker Ric Ross and Mark Samuels, Executive Producer of The American Experience. 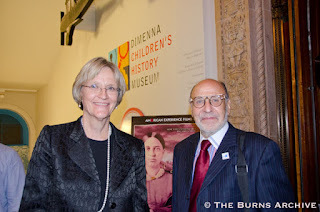 Robert H. and Clarice Smith New York Gallery of American History. 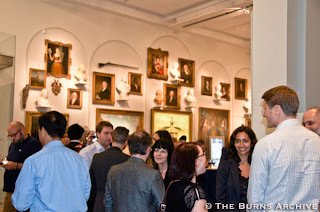 Burns Archive staff member Alice Dana enjoying the gallery before the reception. 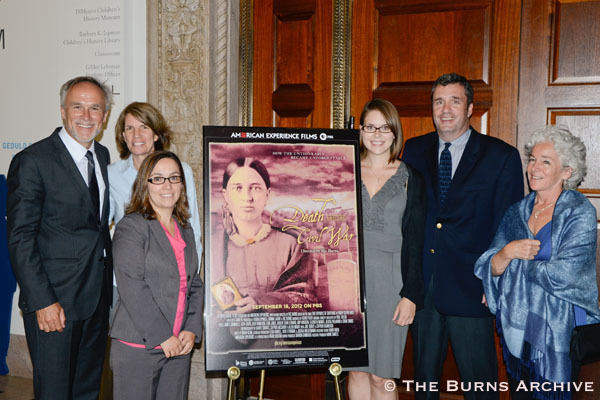 The staff of PBS's American Experience with Dr. Burns. Filmmaker Ric Ross, Burns Archive staff member Lissa Rivera, and Dr. Stanley Burns. The Staff of PBS' The American Experience. 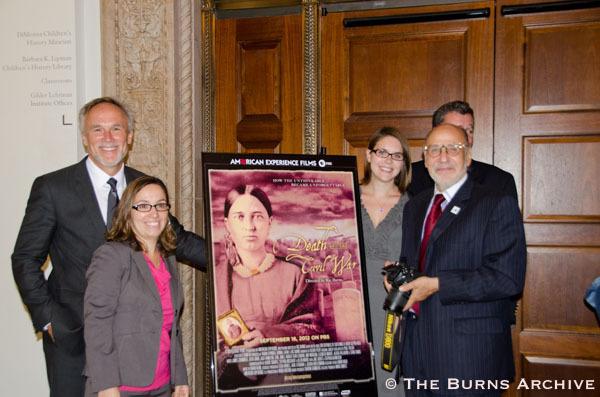 Dr. Burns with the staff of PBS' The American Experience.